Microbial metabolomics is a study of the complete set of metabolites within a microorganism. Microorganism is a bunch of small creatures which can not be easily identified by naked eyes, and exist in multiple forms, including bacteria, fungi, and some algea, and have the most diverse metabolic characteristics. Each microorganism generally has relatively small genome and proteomes, and the genome and proteome data information are far less than that of the eukaryotes. However, the metabolome of each microorganism is very distinctive, and reflects the cellular activity in a more direct way. Thus, microbial metabolomics has been widely used in microbial taxonomy and function studies. 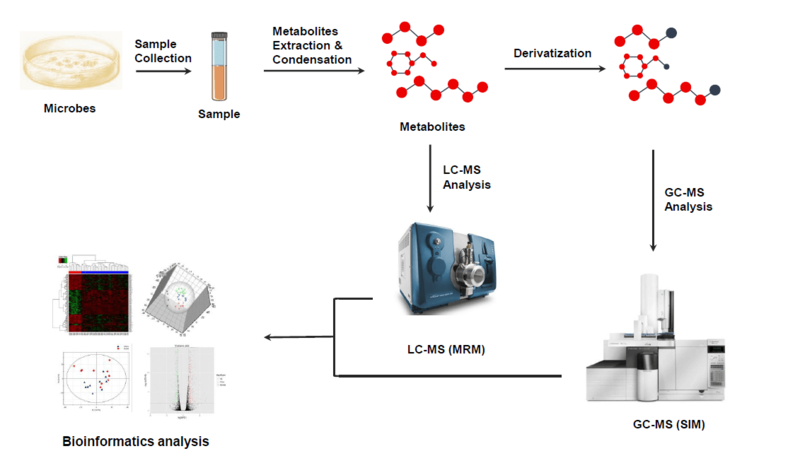 Based on Thermo Q Exactive and AB Q-TOF 5600 mass spectrometry systems, MtoZ Biolabs is proud to offer high-efficient and accurate microbial metabolomics analysis service. We design the most suitable sample preparation methods based on your requirements, and assure high-efficient metabolites extraction and highly accurate microbial metabolomics analysis. *Note: Before we start official experiments, we will perform pre-experiments and test multiple extraction methods followed by mass spectrometry analysis. Based on the testing results, we make sure that the most efficient extraction method is selected for official experiments.